I was born and grew up in Kyoto and inherited a passion for food from my mother. I’ve since been lucky enough to travel all over the world, which has fuelled my interest in food and cookery. London has been my home for the last 14 years and I have turned my passion for food into a successful business here. 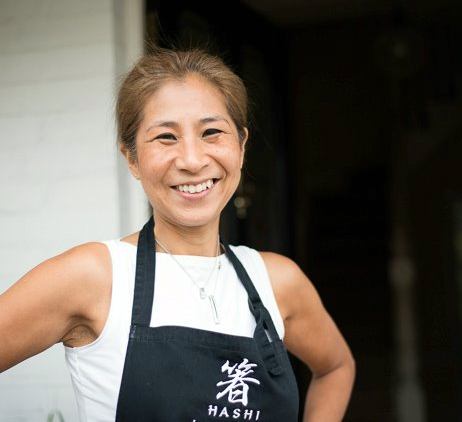 I run Hashi Cooking, a Japanese Cookery school, from my home in Wimbledon. I run classes and courses for absolute beginners, right through to professional chefs. My philosophy is to make authentic Japanese cookery accessible to all. I love meeting new students and, of course welcoming back my regulars! My first cook book, Hashi: A Japanese Cookery Course was published in 2011, and I am thrilled to announce that my latest cookbook Cook Japan, Stay Slim, Live Longer was released this January 2017! Through 100 recipes, this book will introduce you to Japanese food culture and our way of eating, as well as explaining the slimming, life lengthening, enriching, nutritional benefits of the Japanese diet. I love hearing from people with an interest in Japan, its food and culture, so please feel free to get in touch.